Bontom Proudctions presents, THE WORST KEPT SECRETS, by Thomas De Angelis, at the Reginald Theatre, Seymour Centre, Chippendale. THE WORST KEPT SECRETS, is a new Australian play, by a newish writer, Thomas De Angelis. 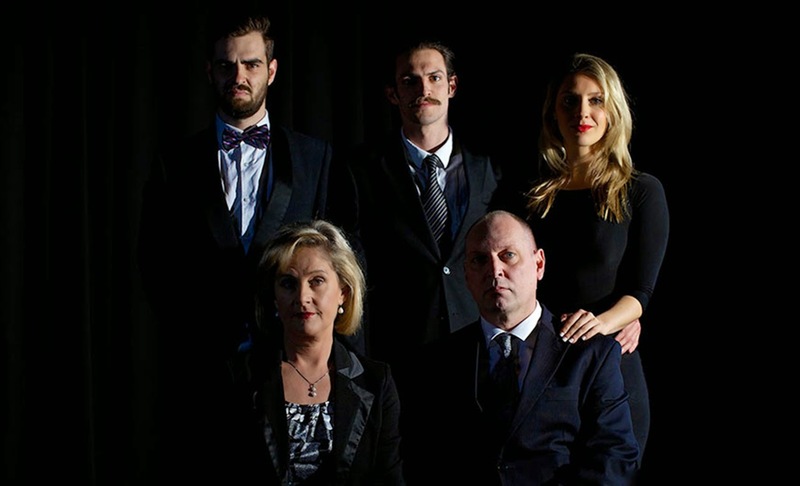 His other play, JACK KILLED JACK was written in 2012, as part of the Sydney Fringe Festival. I am going to write fulsomely about this small production, because I believe there is some playwriting promise, here. It is too rare not to agonise over. A husband and wife political team, he, now, an ex-State Premier, George Steeper (Rhett Walton), and his behind-the-scenes mover-and-shaker, Annie, (Sonia Todd), besides, having a rancorously volatile personal relationship, find that they are shaping up for a 'race' for a public persona renewal as leaders on an influential advisory committee. They have two sons who have fled the 'battle' zone of their parents relationship to create their own lives: Joseph, a modestly achieving fledgling lawyer (Sam Boneham), who has an ambitious journalist girlfriend, Rosie (Lauren Pegus) - who is having an opportunistic secret 'affair' with George, whilst 'fishing' to write his memoir - and Henry (Matthew Morrow), the spoilt 'wastrel'-son, finding study too boring and is instead dealing, very lucratively, in hard drugs, whilst juggling a girlfriend (Paige Leacey) who is wanting more from him than he is prepared to give to their relationship. The play is, mostly, set in the comfortable home of the parents. As you can read, the characters, the social milieu, and the bourgeois concerns and resultant conflicts, of the play, are familiar ones for an Australian audience, and any number of playwrights can be conjured to have being a likely role model for this young playwright's inspiration. And, the one that springs, mostly, to mind, is that of the Grand Master himself, David Williamson. If that is so, Mr De Angelis proves himself a diligent and talented apprentice. He has the security of character, form and structure, down pat, with enough social 'zinger' dialogue going, to keep an audience moderately entertained. Promising, indeed, although, just how funny is hard drug dealing? And, how likely is it that it is not an issue that ought to be a threat to the futures of his parents, two politicians, pursuing public office? Why does Mr De Angelis introduce that aspect of character and plot and not explore it? It is there just for laughs, it seems, as it had no dramatic influence to the storytelling, and logically, ought to have, don't you think? For it is, otherwise, a de-railing McGuffin, for the audience, that is fairly suspect in a (writer's) ethical intention. Mr De Angelis is a graduate with an Arts/Law degree, so I thought he would know, how serious a factor Henry's life choice would be in this 24 hour news cycle world that is a relevant and 'scary' factor in contemporary Australian life! Certainly, Annie Steeper, Henry, the Drug Dealer's mum, would be, should be, very alarmed about the possible consequences to her ambitions. Let alone Dad, the ex-Premier's future. Hmm! My big "beef' with the writing, however, is that, the petty personal lives of the characters are at the forefront of the entertainment with the political setting simply a background, as per usual, of most Australian material of this kind - check out the recent Aussie television program PARTY TRICKS, to see what I mean. Cumulatively, culturally then, for me, THE WORST KEPT SECRETS is relatively, predictably, boring in its content and packaging - cliched - making one long for, even more urgently, for an Australian play (Television screenplay) that had the politics in the forefront of our attention, with the personal stuff, in the background. Might I recommend to Mr De Angelis, the series from Denmark called, BORGEN (2011, 2012, 2013), as a more interesting writing masterwork to emulate, to demarcate a difference as a writer on the Australian scene? Mr De Angelis, besides writing this work, is, also, one of the co- founders of the producing company, BONTOM (Sam Boneham, one of the actors, being the other), for this project - good on them, both, very enterprising and daring - and, also, the Director of the play. Mr De Angelis in his writer's notes talks of his "excellent experience (which was) full of creative collaboration" in putting this production together. I might, then, recommend, further, to Mr De Angelis, that having another collaborator, such as an independent Director, might have been an advantage. I think, there were, perhaps, one, if not, two, too many 'caps' on his head, for the production of this play to reach its potential. Mr Walton and Ms Todd bring intelligent and experienced judgement and skill to the characters, and with Mr Boneham, capture the stylistic naturalisms necessary to make this genre-material writing work. Their performances are very credible, indeed. Ms Leacey, in a small role does, too. These actors know what kind of play that they are in. Unfortunately, both, Ms Pegus and Mr Morrow, under the Direction of Mr De Angelis, although demonstrating an intellectual grasp of the material, play in a representational style of performance that is, mostly, comic superficialities and vulgar indications of a revue sketch kind, telegraphing the character and plot points, constantly, and pull the play out of the stability of its, apparent genre, in opposition to that presented by Ms Todd, Mr Walton and Boneham. That Mr De Angelis, allows this to happen, and, also, then pushes the play into a physical 'farcical' expression at its climax, are judgement errors of style, that he, as Director (or, writer? ), had not prepared us for. Another collaborator, a third or fourth eye, may have been useful, advantageous, to the production. If Mr De Angelis looks at the hysteria that the American social and political satirists, Nicky Silver (e.g. PTERODACTYLS -1993; THE LYONS - 2011) and Christopher Durang (BEYOND THERAPY - 1981; WHY TORTURE IS WRONG, AND THE PEOPLE WHO LOVE THEM), can engender from the beginning base of naturalism, he will find models of expertise for what he might have been directing/writing, if, the Williamson/Buzo style were not it. The Design of the work by Ashley Bell, was simply two full width curtain hangs, one light coloured, one dark (one, badly hung), and minimal furniture and properties - one piece, an ugly, dark poo-coloured cabinet, sat centre stage - an eyesore, indeed - that did not in any way suggest the likely affluence of the people in the play. It demonstrated careless or lazy detailing. It needed more collaborative discussion! The Lighting has no collaborator acknowledged, and was useful if not really designed; the Sound Design by James Anthony-Couples was perfunctory and not very technically sophisticated. The sum of all this is, is that I was impressed with Mr De Angelis as the writer, but based on this experience in the theatre, I want to encourage, on his next production-enterprise with BONTOM, to collaborate more widely, for luck, that he mentions in his notes, has little to do with quality of result. Clare Grant. Be Careful What You Wish For.